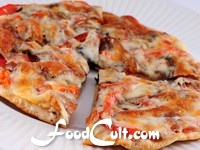 Pizza - Free, Easy Recipes @ FoodCult.com - A Place for Galganov's Recipes and More - Food Matters! Pizza - it's not just for your stomach! visit WallpaperOriginals.com to get pizza for your monitor. It's really worth remember ... any pizza crust dough recipe will also make a PERFECT calzone, pizza pocket, panzerotti, or even a good stromboli. Extra dough is like a gift from the pizza gods ... pull it from the freezer, preheat your oven, dress it (while it's still frozen - you don't have to wait for it to defrost) and bake it up. You've got great pizza in 30 minutes! We usually freeze pre-formed doughs with the tomato sauce already on. Of COURSE you must know that pizza CAN be a vegan meal. The crust, by its very nature, is vegan and you don't have to put cheese on top. You "may" ... you may also use vegan cheese substitutes but pizza does not have to be dressed with meat or cheese at all! Don't forget to check our page on Pizza Tools and Utensiles in the tools section. Learn about your pizza pan alternatives. "Let there be pizza on earth and good will to all men"
Not many people don't enjoy a good pizza ... dressed to their tastes. One can put some pitted kalamata olive pieces, slices of sweet bell pepper and crumble some feta to bring a Greek taste to this dish plus a bit of mozzarella to create that tackiness many of us like on a pizza ... or you can dress your tomato sauced pie with a few, thin tomato slices, some cut asparagus spears and some buffalo mozzarella for a nice fresh-tasting variation on pizza toppings. Instant pizza is a great way to get started. When the bug really bites you, you will want to try our very easy, basic, home-made pizza dough.